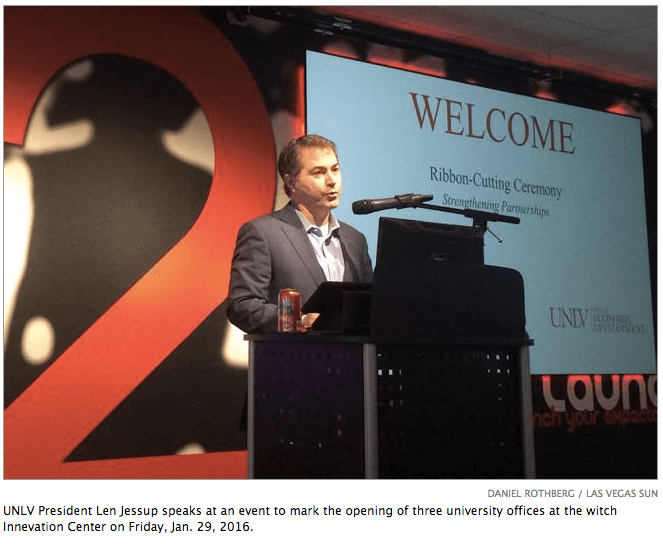 State lawmakers and top university officials attended the opening today of three UNLV offices at data company Switch’s Innevation Center, reports the Las Vegas Sun. The center will house portions of UNLV’s economic development office and its research foundation. The university’s Office of Economic Development, which was started five years ago to encourage private-public partnerships, will still have a presence on UNLV’s campus. “This is really the gateway for us to engage with the rest of the community,” said Zach Miles, an associate vice president for economic development at UNLV. Miles also serves as the director of the UNLV Research Foundation, a university-related nonprofit that supports research and will have a presence at the new offices. Switch donated the space to UNLV, Miles said. University officials spoke of a close relationship with Switch, noting that one of its Las Vegas data centers is home to UNLV’s supercomputer. Read more about the announcement from the Las Vegas Sun.